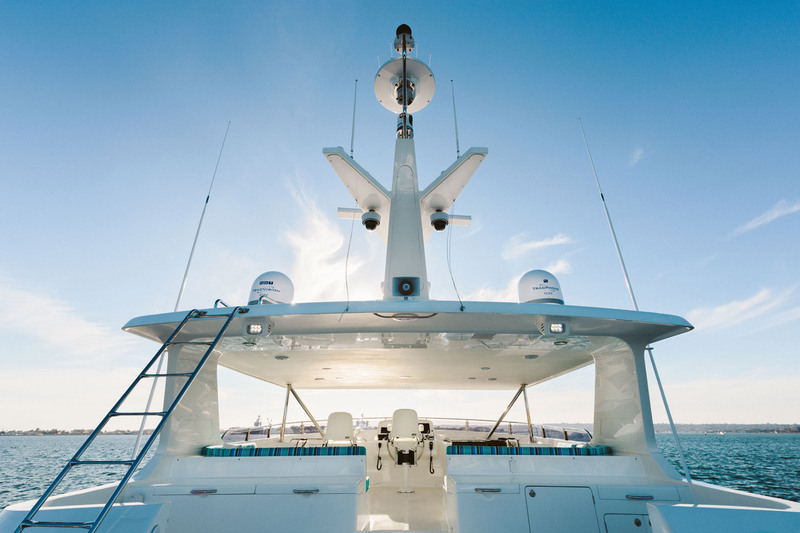 Outer Reef Yachts builds go-far boats renowned for their safety and stability, as well as their customization. 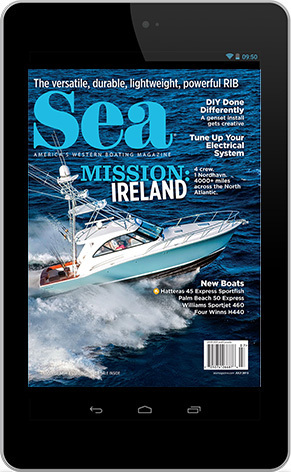 The vessels are built to Open Ocean A guidelines, allowing them to explore cruising grounds from the Caribbean to Maine and from Mexico to Alaska. 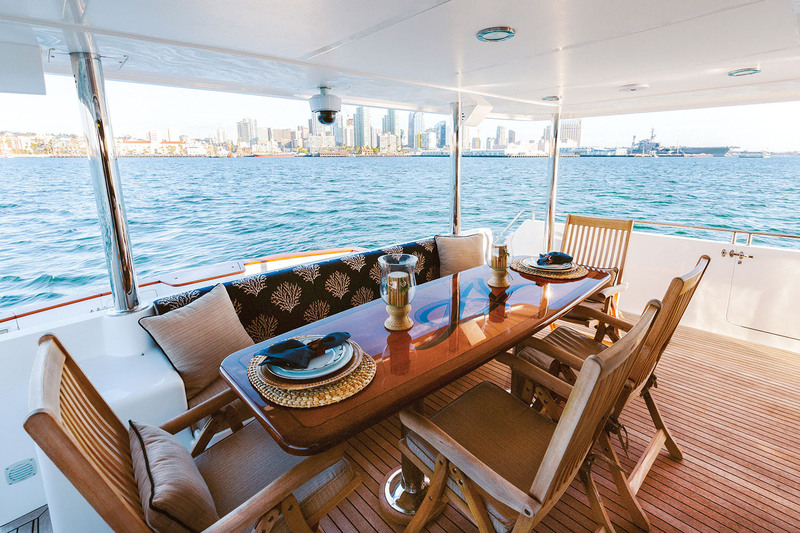 It’s no wonder then that the owner of our test boat, an Outer Reef 880 Cockpit Motoryacht, was mid-voyage when we met in San Diego. He was on his way back from Alaska and headed to Mexico, but that was, literally, only part of the story. He described planning his dream voyage for the past seven years and finally realizing it as he prepared the boat and the crew to head farther, around South America and up into the Caribbean. Nice dream to have, and an even better one to be in the process of realizing. The Outer Reef 880 is built with three molds: flybridge, deck and hull. The hull mold can be dammed to create vessels of varying lengths, which translates to an aft cockpit of different sizes. The semi-displacement hull, which flares at the bow, is optimized for speed underway but also for stability when at rest, and the keel runs the length of the hull but stops just short of the cockpit. The hull is cored with PVC foam above the waterline and is a vacuum-bagged construction that results in a stiffer build and less resin wasted. The sidedecks on this vessel are wide and have high gunwales, not just handrails, for maximum protection when moving about. Side gates are incorporated both forward and aft to ease disembarking, regardless of the length of a slip, and the decks lead to the Portuguese bridge forward, which is a cross-member that provides both safety for people on the bow and structural integrity for the vessel. The aft end of the boat is very versatile. 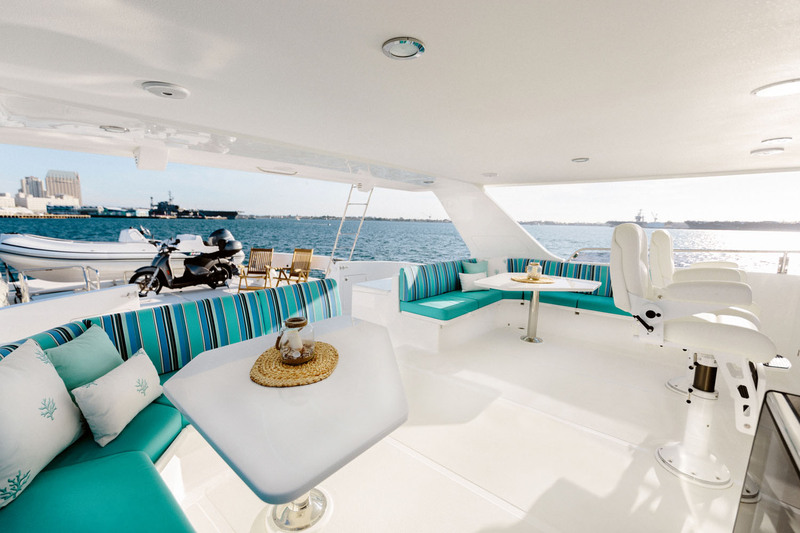 The upper cockpit is a great place for outdoor dining, at least with the optional refrigerator, sink and galley. Steps on both port and starboard (or just one side if desired) lead down to the lower cockpit, which varies in length by model. 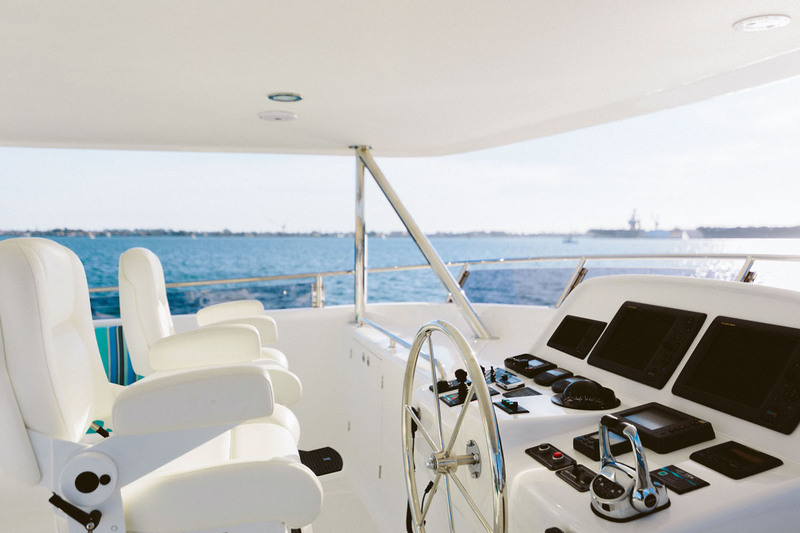 Some people may think of this as the fishing cockpit if a fighting chair is installed, but for others, it’s a perfect place to suit up for diving or even a safe playground for grandkids. The engine room door and the gate to the swim platform are also accessed easily from here. 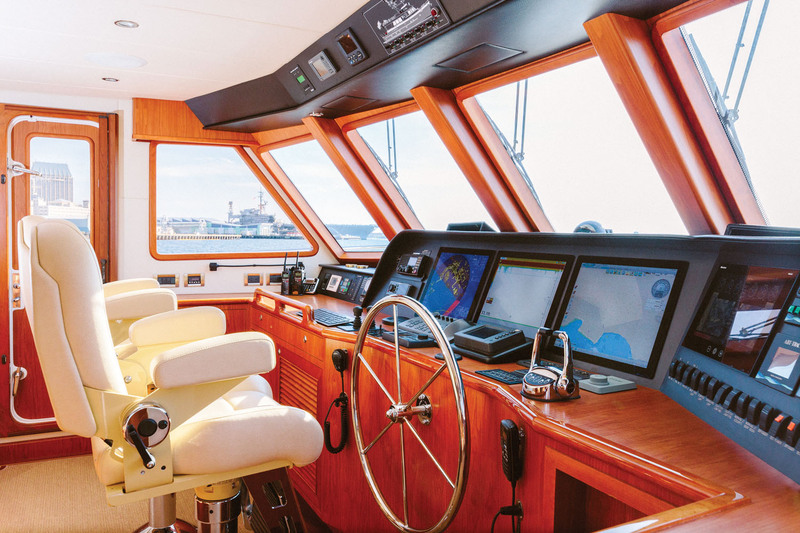 Two main helm stations offer different benefits aboard. 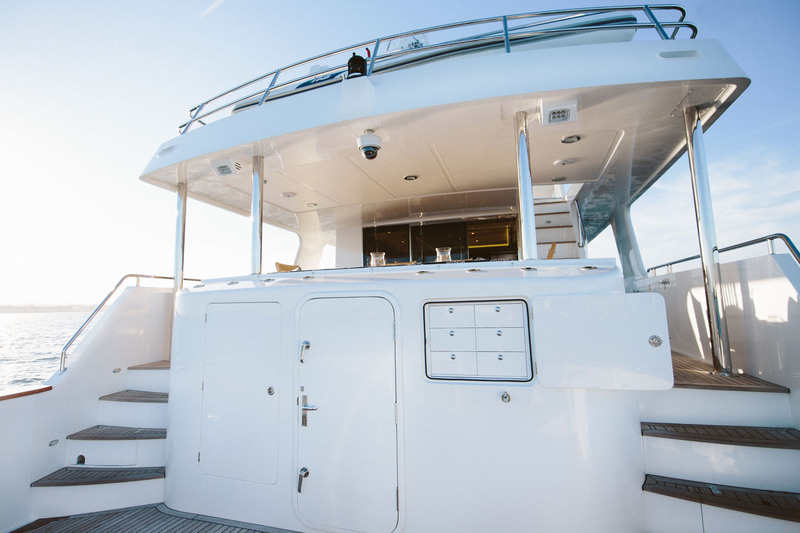 On the flybridge, the visibility forward is excellent. The well-laid-out dash includes twin MFDs and thruster and engine controls, and there are twin Stidd chairs for comfort. 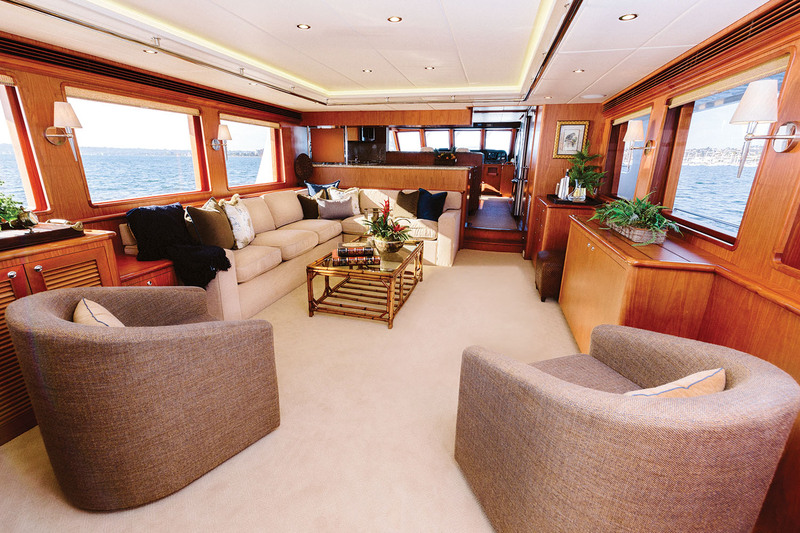 Two L-shaped settees with tables are aft, and an outdoor galley is optional. The open top deck has plenty of room for an athwartships dinghy and a lift, plus space for bikes, PWCs or other toys. If conditions aren’t conducive to driving up top, the lower helm on the main deck is a true ship’s command pod. On our test boat, three Furuno screens combined into a glass helm, angled appropriately for best visibility from another two Stidd captain’s chairs. Side doors allow the captain to move out to either deck quickly if assistance is needed with docking or when sailing shorthanded. Due to the Portuguese bridge and the high bow, visibility can be a challenge from here, but that’s the tradeoff when you have so much ship ahead of you. 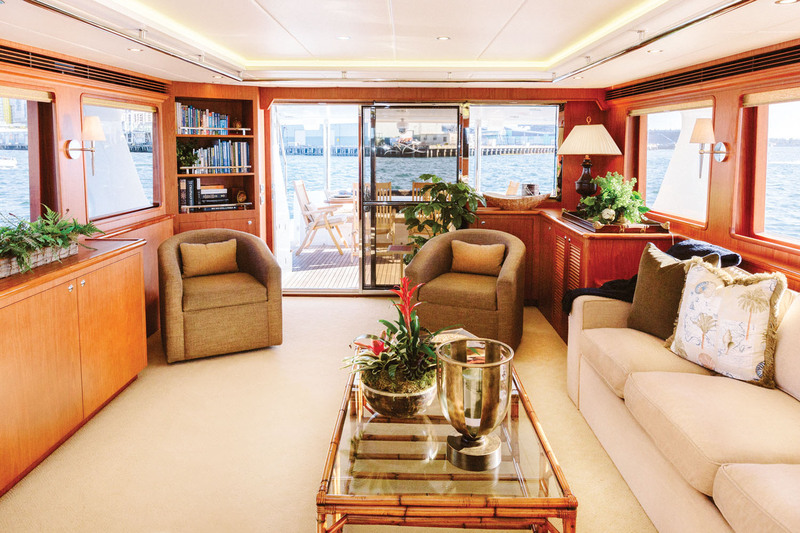 Perhaps, for the best of both visibility and protection from the elements, one could opt for an enclosed skylounge on the flybridge, which encases the upper helm and settees in a fiberglass structure but still leaves plenty of room for outdoor deck storage and lounge space. A third “helm” is a Glendinning remote in the aft cockpit, which adds control when backing into a slip. Outer Reef offers an allowance of $60,000 that each owner can use to personalize the décor with the help of Deborah Manzi, the in-house interior designer. Pretty much, if the owners’ wishes don’t impact the function or structure of the vessel, they can specify what they like. 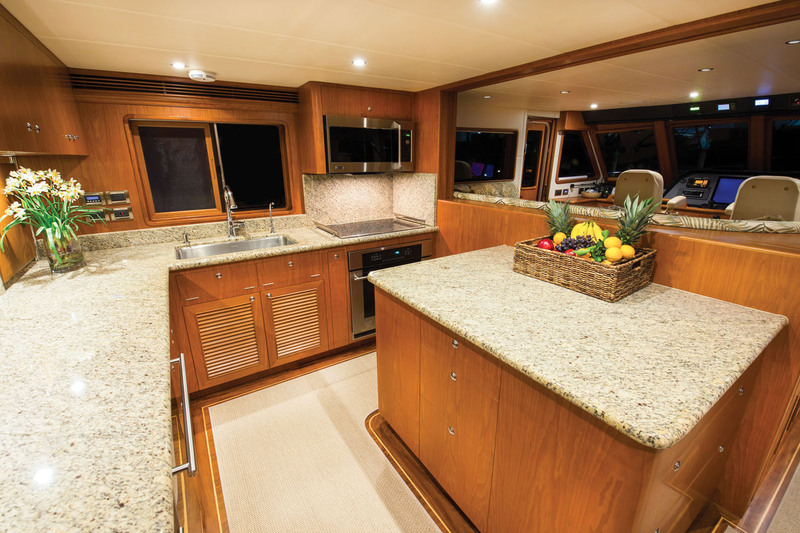 A highlight is the galley, which is positioned between the long salon and the pilothouse. 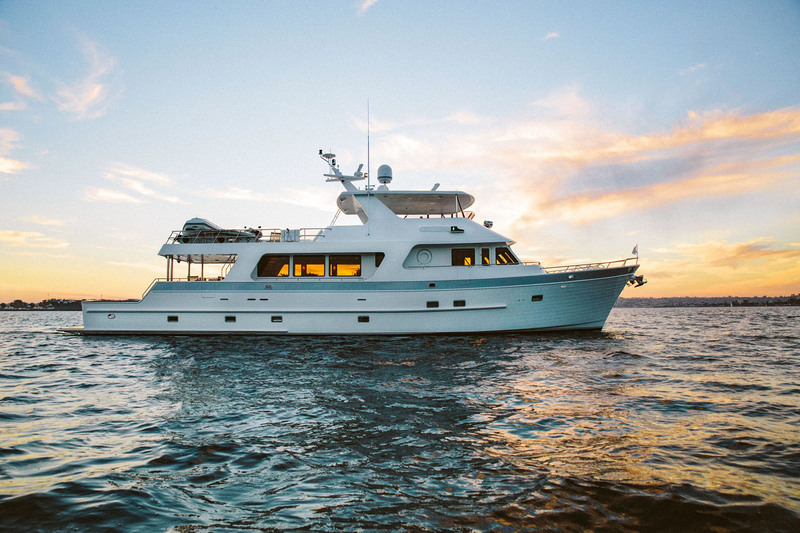 Here, the chef will be perfectly comfortable not only due to the plethora of household-sized GE Monogram appliances and an acre of granite countertops, but also because he is in the center of the action aboard. It’s easy to converse with people lounging in the salon or keep tabs on what’s going on at the helm. 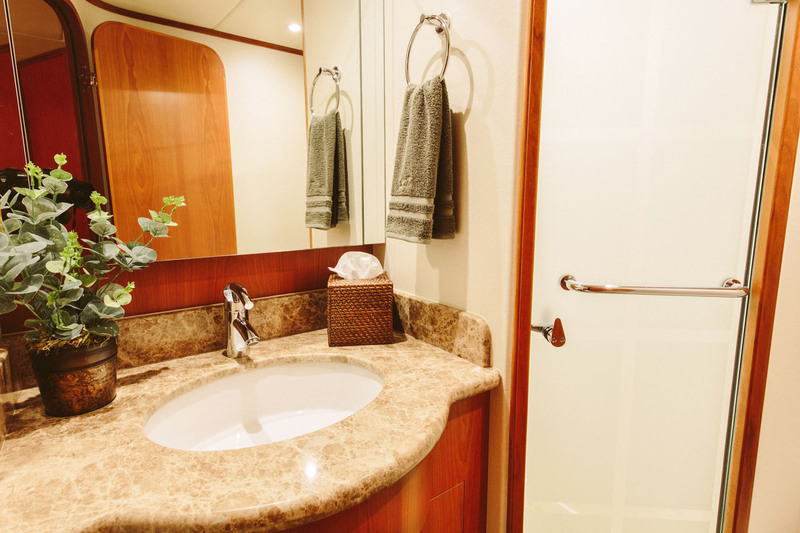 In case privacy is desired, or if lights in the galley could impact the captain’s night vision, a vertically rising panel and a pocket door close off the pilothouse from the rest of the main deck and social area. 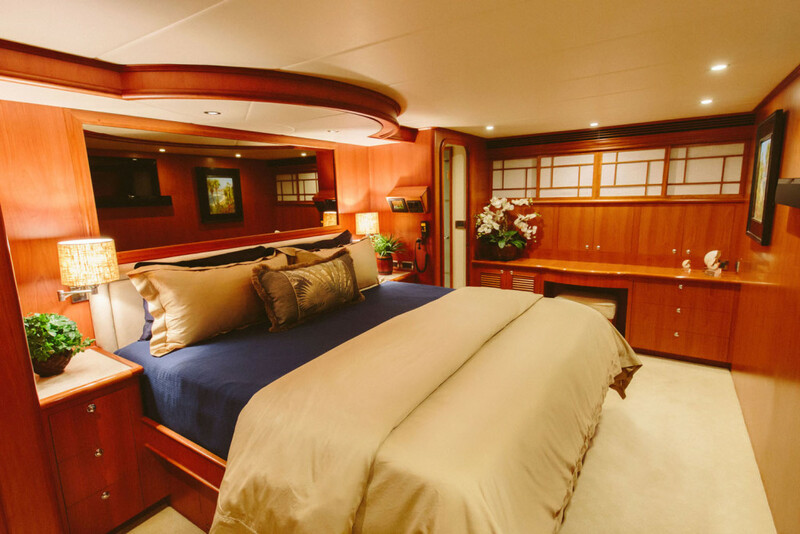 Below, the ORY 880 offers three cabins: one with twin beds to port, a double with a centerline island berth forward and the full-beam master with a king-size bed amidships. The master is sound and vibration insulated from the engine room, since the head and walk-in closet separate the two spaces. 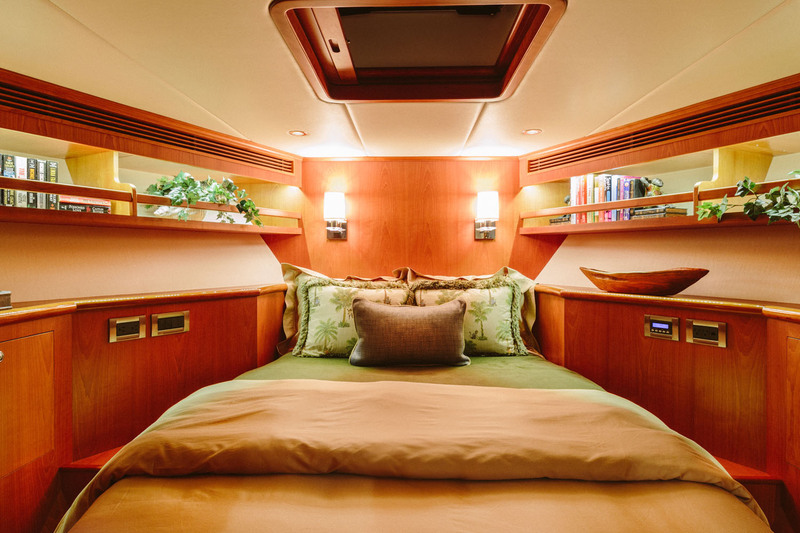 A mirrored headboard may be added for a greater perception of space, and a vanity desk with ample built-in storage will allow owners to linger comfortably at their laptop before joining other passengers on deck. All cabins may be moved modified to allow a more custom interior. 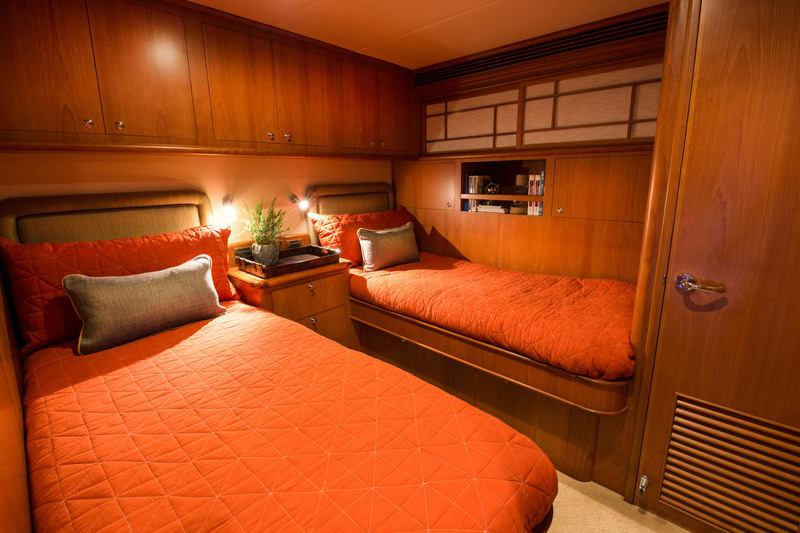 The crew quarters are as nice as any I’ve seen on superyachts 30 feet longer. Kids will love having the area to themselves if no crew are needed. I admit I’m an engine room junkie. I like to start each vessel walkthrough here, because it gives me insight into what will be going on at the helm later and provides clues to the attention to detail during the yacht’s build. The 880’s engine room is massive, taking up more than 20 percent of the hull length, which is why the access to the systems is so good. The engine room floor is aluminum and has no bulkhead, so it’s easy to move about. The twin Caterpillar diesels (standard are C12 700 hp engines but our test boat had C18s with 1,000 hp) are serviceable from three sides and the two 25 kw Northern Lights gensets (upgraded to 30 kw) and ABT Trac seven-and-a-half-square-foot stabilizing fins are standard. Headroom is ample at six feet, five inches, and a small sink allows for quick clean up. Everything is well attached, sealed and insulated for sound attenuation. The layout, space and details give a positive sneak peek into how the rest of the vessel was conceived and constructed. Our test was done in San Diego Bay on a beautiful winter day with winds of 8 to 9 knots, flat water, full tanks and six people aboard. 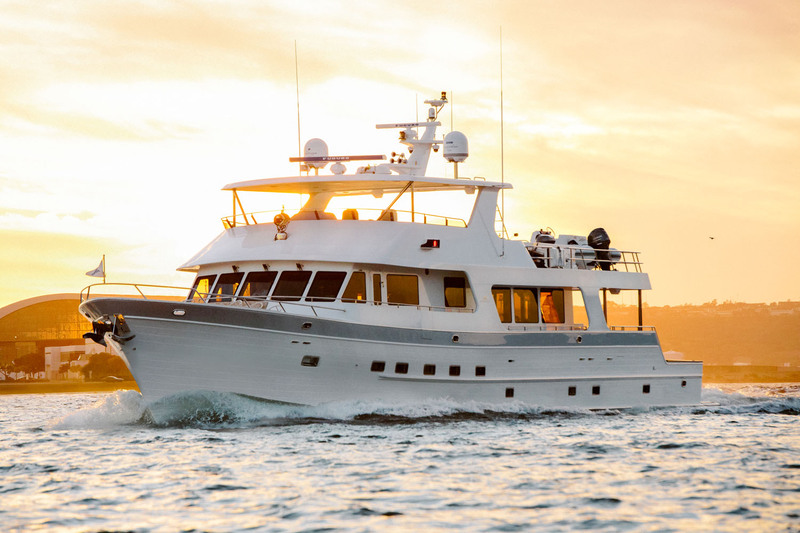 The Outer Reef 880 ran smoothly with slow and deliberate moves, as befits a vessel of nearly 100 tons. The turns were even and gradual as we maneuvered around the bay. In close, the bow and stern thrusters made it fairly nimble, even when docking in a cross breeze. The yacht topped out at 14.2 knots while burning 106 gph at wide-open throttle, but I can’t imagine running at that speed for any distance other than to dodge a storm. Instead, we found a more economical cruise at 9 knots, where she burned 12.4 gph. With 3,000 gallons of fuel aboard, she would have a range of 2,100 miles, plus a bit to spare, depending on conditions. At 11.1 knots, the diesels were burning 32.3 gph at 1615 rpm. When I asked the owner what he liked best about his ORY 880, he reflected for just a moment. The resounding answer: the emphasis on stability. Draft 5 ft., 6 in. 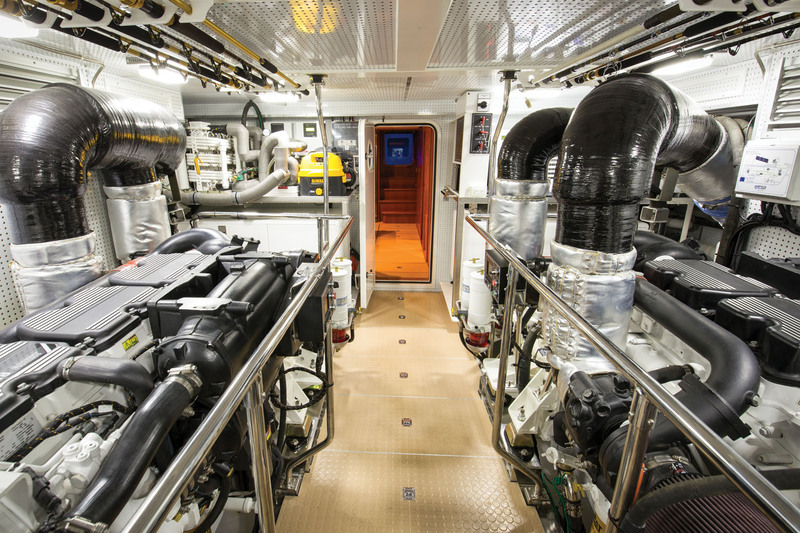 Twin C12 700 hp diesel engines, two 25 kw Northern Lights gensets, 4 kw inverter, AGM batteries (1020 aH), ABT Trac 38 hp hydraulic bow and stern thrusters, ABT Trac 250 stabilizers and more. 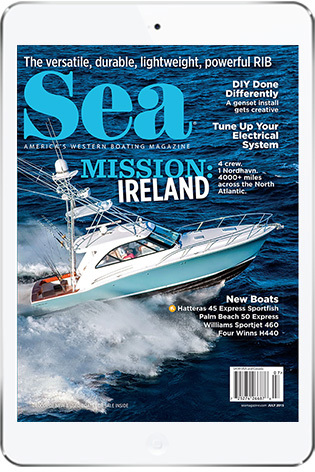 Electronics package, twin 30 kw genset upgrade, second Maxwell VWC 4000 hydraulic windlass, 1,800 gpd water-maker, proportional power thrusters, underwater LED lights and more. 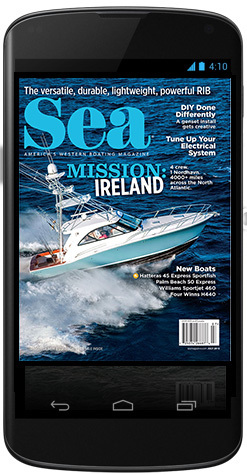 This entry was posted in Boat Tests and tagged motoryacht, yacht test, yacht review, luxury yacht, Outer Reef Yachts, outer reef 880, cockpit yacht, cockpit by bsheehy. Bookmark the permalink.